Hafþór "Thor" Björnsson, aka The Mountain on Game of Thrones, is monstrously huge. 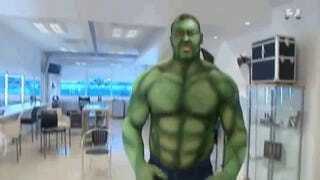 So of course if you're gonna get someone to dress up as the Hulk, it should be him. Note: turn closed captions on for English subtitles. Watch as the competitive Icelandic strongman (and seemingly all-around cool guy) gets a full body Hulk airbrushing for one lucky/terrified 3 year old's birthday. I don't blame the kid either. Hell, I'm an adult man and that guy would scare the living crap out of me.